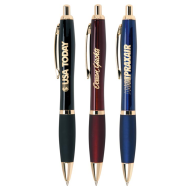 Promotional pens with logo are one of America's favorite personalized products. Everyone has them, uses them, and can remember who gave them an imprinted business pen with logo. 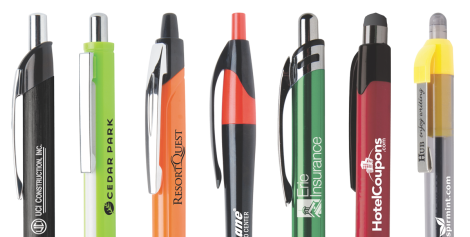 We have hundreds of logo promo pens in all different styles, shapes and colors. 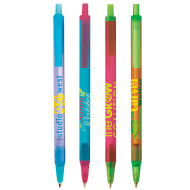 Choose from inexpensive promo plastic pens, laser engraved custom metal pens and promo stylus pens. Browse through our collection and find the perfect personalized pen for your brand. Ever since the modern BIC ballpoint pen was introduced in 1952, personalized writing instruments, especially imprinted pens, have become one of the most popular promotional products on the market. 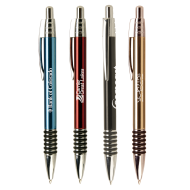 Choose from our wide range of inexpensive imprinted plastic pens to affordable laser engraved executive metal pens. Another important factor about promotional pens is that they are given from one person to another roughly eight times over their useful life. That means that a wide range of potential customers see your advertising imprint, creating a huge number of new prospects for your products or services. 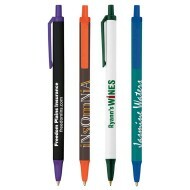 Put some logo pens on your counter or on a table in a reception area. Give them away at trade shows, seminars, grand openings or new product launches. Hand out a custom pen to people that you meet on the street. The ways to give out a personalized custom imprinted pen are endless. And because they are so affordable, you can hand out these inexpensive pens without breaking the bank.